Hmmm. Oil change AND a sandwich! I want to hear your guys’/gals’ worst oil change stories. I read some funny ones in the comments on the article posted today. I want to hear Oppo’s horror stories. Maybe it was a nightmare franchise experience; or maybe you goofed up really bad on your own. I’ll start with mine. My grandpa asked me to take his 2010 Cadillac DTS to Jiffy Lube to get a quick oil change. He drove nothing but Cadillac’s his entire life. He even was buried with a set of keys from his last car, as well as an old hood ornament. This is important later. He had a free oil change coupon or something similar. I warned him of my concerns about places like that, but he insistes. So I took his car there, and asked for whatever was on the coupon: Free full synthetic oil change, with inspection and fluids topped off. 20 minutes later, I see a few “techs” around the engine bay moving in a rush. I poke my head out to see what’s going on. “Is this your car?” they ask. I informed them it was my grandpa’s. “Did...he ever get his engine swapped?” Now I am confused. I asked them what make and model did they look up for specifications. They showed me that based of the license plate number, the make and model was a 1996 Cadillac Sedan Deville (previously owned my the same guy). Apparently, they look up license plate numbers for vehicle history and info...not the VIN. So they overfilled his engine, so much there’s oil covering just about everything. It’s dripping into the pit below. After an hour or so of heavy clean-up, and an even longer phone call with a manager of some sort, I get the car out of there. 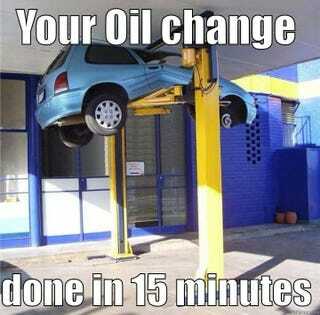 They gifted me free oil changes for a year; which I laughed out loud to the manager on the phone. Now, I only drive into those chain stores to have them top off air in my tires when its cold. Even then I worry they cant do that correctly.